Discover Russia’s first capital, a surviving ancient sand dune, a city called the Venice of the North and an arc that helped determine the shape and size of the planet. These sites help illuminate Russia’s historical, natural and cultural heritage. In this series RBTH examines the many wonders that comprise Russia’s 26 UNESCO heritage sites from east to west. UNESCO’s World Heritage Site program seeks to preserve natural and cultural landmarks that are deemed of global significance. This article concludes our journey across the Eurasian continent: part six in this series highlights northwest Russia’s UNESCO sites. Considered Russia’s first capital, Veliky (Great) Novgorod (usually simply known as Novgorod) was first mentioned in the chronicles in the mid-ninth century. Today the city is a living museum to ancient Russia, featuring some 50 medieval and early modern churches. At its zenith in the 1300s, Novgorod was one of the largest cities in Europe and was one of the few early Russian settlements that were never conquered by the Mongols. Originally governed as a city-state through a People’ Assembly, Novgorod had much in common with the cities of the Hanseatic League, with whom the town maintained close trading relationships. A major center of spirituality, much early Russian Orthodox scholarship took place here including the first translation of the Bible into Old Church Slavonic, the written predecessor to modern Slavic languages. Novgorod was an artistic hub throughout the Middle Ages and the frescoes that cover the walls of the Church of the Transfiguration were painted by Theophanes the Greek in the late 14th century. Theophanes is credited with reviving Russia’s medieval painting school and taught Andrei Rublev, who became the country’s most prominent icon artist. It was only after Muscovy’s conquest of Novgorod in 1478 that Moscow became the most important city in the Russian world. 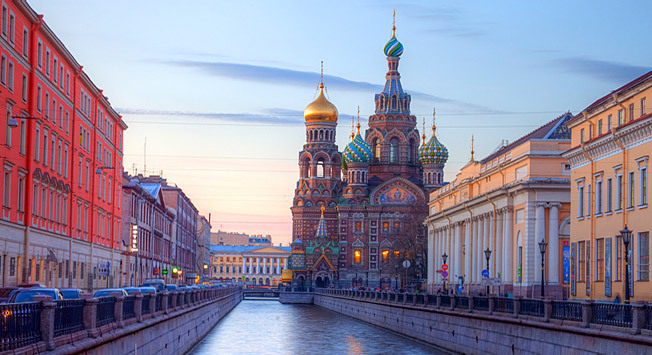 What’s there to say about Russia’s most beautiful city that hasn’t been said before? Containing an ensemble featuring Baroque, Neoclassical and traditional Russian-Byzantine constructions, St. Petersburg has few architectural equals in the world. The imperial capital of Russia for nearly 200 years, the Admiralty, Winter Palace, Marble Palace, Peter and Paul Fortress and the Hermitage, are all particularly noteworthy. The city was built through forced labor, Ottoman and Swedish prisoners of war and Estonian and Finnish laborers and designed by many of Europe’s most celebrated architects on a series of islands beginning in 1703. The brainchild of the gargantuan Russian leader Peter the Great (he was reportedly 2.03 meters or 6’8), he had oversized dreams for this settlement, which today has more than five million residents and is connected by bridges, canals, quays, streets, highways and tunnels. Amazingly the bulk of the construction in this swampy locale took place in less than 20 years. St. Petersburg (which later became Petrograd and Leningrad before reverting back to its original name in the 1990s) experienced a second boom of development in the 19 th century when the Kazan Cathedral, St. Isaac’s Cathedral and many of Italian architect Carlo Rossi’s masterpieces were designed including the Alexandrinsky Theater, the General Staff Building and Palace Square. The suburban tsarist residences at Peterhof, Lomonosov, Tsarskoe Selo, Pavlovsk and Gatchina were also cited for inclusion to UNESCO’s list. The Struve Geodetic Arc is a series of triangulations (a series of triangles used in surveying land) stretching over 2,800 kilometers through 10 countries from Norway to the Black Sea. The project was German-born Russian astronomer Friedrich Georg Wilhelm von Struve’s creation, who had the goal of measuring a long portion of a meridian in order to ascertain the Earth’s size and shape. Tsar Alexander I covered the bulk of the project’s expenses. It was noted by the UNESCO committee for representing an early example of large-scale scientific cooperation across numerous kingdoms. Between 1816 and 1855 a chain of 258 main triangles were installed including 34 markers, which were cited for inclusion on this list. These holes drilled in rock, iron crosses and obelisks are today scattered from Ukraine to the top of Norway. Formed around the third millennium B.C., glacial debris formed its foundation with wind and sea currents pushing enough sand to raise and sustain the land bridge above water. The fragility of this extraordinarily thin landmass, which has managed to survive for well over 2,000 years with residents as varied as Teutonic Knights, fishermen and artists, is what makes this natural wonder so remarkable. However, it UNESCO included it not for its beauty, but for being an outstanding and unusual example of continuous human settlement.